Recently I started a petition on the UK Government's petition website. At first glance it may appear to have an anti South African stance about it, but it really doesn't. Saly, I was limited to a certain number of characters and after several attempts this was the best I could come up with. This isn't anti South Africa or South Africans, far from it. What it is about is stopping what I feel is a gross injustice. After 12 years in this beautiful land and despite having permanent residency and a cinstitutional right to remain in South Africa, I am still prohibited from voting in any elections. However, any South African who lives in the UK can vote in all UK elections providing they meet the residency criteria and have registered to vote. This is not fair! 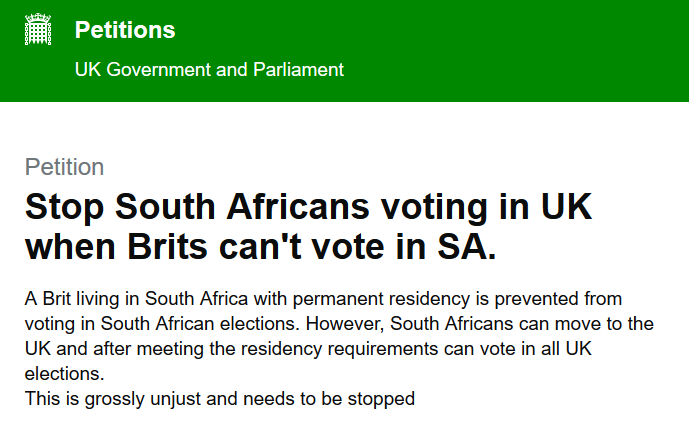 With no reciprocal agreement allowing Brits to vote in SA then South Africans should be prohibited from voting in the UK. What this petition is about is democracy at its most basic level. You may or may not be aware that any “qualifying Commonwealth citizen” can vote in all UK elections after meeting the residency criteria which is normally three months. So Canadians, Aussies South Africans and many many others have every right to vote in UK elections as long as they’re living there and are registered to vote. Other than South Africa and the UK, I don’t know if any other Commonwealth country has a reciprocal agreement with the UK allowing British expats to vote in their elections, but I do know that South Africa absolutely does not! The only people who can vote in South African elections are South African citizens. No exemptions, caveats etc. If you’re not a South African citizen you cannot vote in SA. To add insult to injury; recently I was chatting with a local SA businessman here and we got talking about the then forthcoming EU referendum and he asked how I was voting? I answered that I’m unable to vote because I’ve lived outside of the UK for too long. He then told me that he and his wife were voting by postal votes, despite the fact that they left the UK a couple of years ago. I was gobsmacked and quite angry, not only was this person no longer resident in the UK but they were blatantly abusing the system! I fail to understand how people from one nation can vote in another without there being some kind of reciprocal agreement. In the absence of any such agreement there should be no voting rights either way. If you believe in fairness and democracy please sign this petition and forward it to as many people as you can.